Create attractive PSD files with ease! Design stunning and unique website content to stand out from the rest by using world-class PSD Design Services. In this modern generation of the internet age, managing a sophisticated website has become one of the most important aspects of running a business. Your website can speak a lot about your company and its products. A good website usually attracts the target audience to stay on the web pages generating more popularity of the website. It can even introduce your business to the global audiences who can be your potential customers. When you are thinking about redesigning your website, availing PSD Design Services can be one of the best ideas you have ever put into your business. In the online market, you have to compete with thousands of competitors who are running the same businesses as you are. In such a situation, the most important question that comes to your mind is “how to make your business stand from the rest in the crowd?” Well, in terms of online or internet-based businesses, the website is the only way of promoting your company and its brand image. Various big brands keep their company websites under constant changes in visual appearance. This lets the audience to look at something new whenever they visit the website. You can get PSD Designs of new and unique logo packs, icons, banners, flyers etc. from an efficient PSD design company in Dubai which is renowned for its superior graphics designing works. SEO-friendly format: In-built SEO permalink structure is beneficial for using PSD layouts while designing your web page. It lets the search engine easily find your website among the billion other web pages on the world wide web. Lossless layout files: PSD files can be extremely large in size due to its data-loss free property. The file saves various type of effects applied to icons, button layouts, banners etc. Layer Preservation: The PSD formats are basically intended to preserve every design on a layer by layer basis of graphical components. This allows the user or the designers to easily modify, customize and rearrange the web page and determine how it will look. Universal Compatibility: The PSD format and its elements are supported and compatible to view in most of the web page editor or designer software. You can directly import any PSD file on any type of graphic designing application and start redesigning your website to a whole new look. 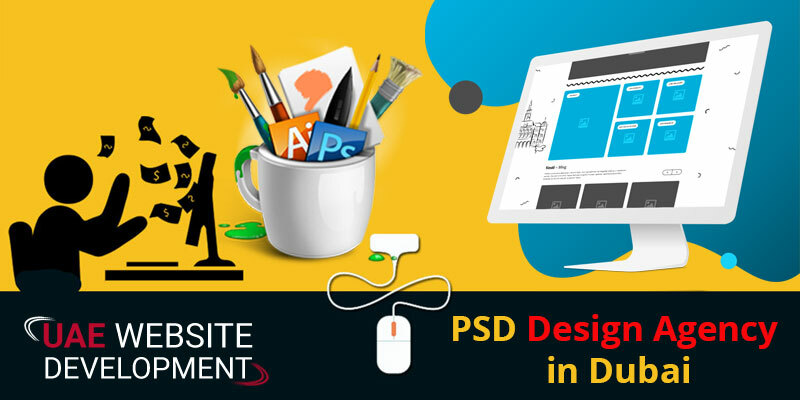 Dynamic quality and functionality: PSD helps the designers to create static layout based graphics files which are developed with new and modern technologies. You can get high quality on every pixel of the icons or web page elements that you have designed on the PSD file. Now, you might be looking for the best PSD Design services in Dubai. You have reached the right place to get all your web designing solutions under one roof. We understand the importance of timely updating your website to redesign what your audiences see on it. Our skilled PSD designers are helping thousands of users who want to make their websites look better. We have the reputation for completing the highest number of web page designing projects every week. Our unmatched web designing services get a huge number of positive feedback from our customers. The design teams that we employ have years of experience working on PSD designing software technologies. We will serve you with the premium PSD Design Services that you need to make your web page look better. Call us at our helpline number 042053349 to get in touch with our superior design personnel. We are available on our new and improved Live chat service to give a better response to your queries. We make sure to draw a smile on your face by providing you with our quality solutions under an affordable price range.